Marketing communication is that type of communication aimed at transforming the prospective customer into an effective customer. That is to say, it is communication that acts directly on the behaviour of potential customers (prospects) but not only: marketing communication may also have important effects on company positioning and may be useful for transmitting relevant messages in corporate terms. As noted in the first part of the article, the yachting world is characterised by a strong system of relationships which must be strategically handled, including through the development of integrated communication mixes aimed at the selected target market. The purpose of this analysis is not to describe elements connected with the communication process and its operational phases: there are marketing texts that describe and analyse this in depth. The aim here is to analyse marketing communications in shipyards operating on the luxury yacht market. Development of accreditation and authority. For professionals handling shipyard marketing it is indispensable to know in minute detail how company communications are carried out. The fundamental elements of the communicating process are the communicator (the shipyard) and the receiver (owner), while the main instruments are the message and the medium. Substantially, the shipyard transforms a thought, an idea, into a symbolic function, developing a message that is none other than a grouping of symbols that the communicator transmits. In encoding the message it is also important to evaluate how the target public will decode it. Shipyards should also develop feedback channels so that the sender can know the receiver's response to the message (marketing communications efficiency analysis). In order for a message to be efficient the yard's encoding process must be suited to the receiver's decoding process. The communicator's task is to succeed in sending a simple, clear, interesting message that may be repeated several times in order to satisfy the given requisites. Once the message has been defined the shipyard must define the medium, i.e. the communications channel through which to send the message to the receiver who will then decode it. Marketing communications channels may be personal and non- personal. Personal channels are characterised by the fact that two or more people communicate directly. The efficacy of such channels derives from the possibility of personal interaction and of verification of the reaction to the various messages. Non-personal communications channels consist of media which transmit messages without any personal contact and without the possibility of verifying their impact. Considering the characteristics intrinsic to luxury yachts (for further information see the first part of the article), since we are dealing with a costly and high social profile product, the personal channel certainly plays an important role in a shipyard's marketing communications. In the context of personal communications channels , social channels take on particular importance because, in terms of purchasing, verbal influence is more persuasive: word of mouth and public relations are among the main marketing communications instruments in the luxury yacht sector. If it is to have a really strategic function, communication must precisely define the typology of its interlocutors, its objectives, the instruments it intends to employ, the expense sustainable and the intervention time schedule (marketing communications strategic approach). The basic idea is that you don't have to wonder about how to sell the product 'yacht' but rather about how the target's needs and desires may be satisfied. As pointed out in the previous article, communication moves within the axis of the four A's (awareness, attitude, action, action two) which lie at the base of the target market's behaviour. To optimise the lifetime value of the target market, communication must also move along the axis of the four A's, with attitude which conditions behaviour and vice versa. Setting out downstream of the four A process "action of repeated purchase" we find a loyal customer who is a great yacht buyer. Here, substantially, we find those individuals who, having bought a boat, become increasingly enthusiastic yachtsmen and seek boats that are more suited to their needs and are increasingly larger (owner's dimensional trade up cycle). Carrying on along the axis, before having a repeated purchase we must have the initial action or purchase. In many cases an owner must have a positive attitude towards the boat before the initial action can take place. The attitude towards a specific boat is created through the image communicated by the yard, the way in which it presents itself and a series of other factors which influence potential customers' attitude. It sometimes happens that there is such a positive attitude towards a vessel as to induce purchase, but if there is a bad experience in the past with the boat and/or yard, a negative attitude is developed which leads not only to a refusal to buy boats from that yard but also to spreading the negative attitude among that person's circle of contacts and acquaintances. So attitude automatically conditions action and action conditions attitude. assisted awareness: when consumers recognise a boat or brand when its name is shown or suggested. The cumulative effect of the specific awareness levels and the attitude generated by each of the tactical instruments permit achievement of the general communications plan objectives. Global communication of the plan, in turn, has the task of implementing positioning through marketing strategies whose goal is to satisfy the respective marketing objectives and thus achieve sales objectives. Advertising has a fundamental role in building up the perception of luxury. The process of inferring attributes of status, prestige, dream and quality linked to an object, on the basis of the elements that describe it, is a natural predisposition in individuals. The role of advertising in conferring a certain status on a product is concretised in the use of symbolic language aimed at imbuing the goods with the attributes desired by the vending company. To this end admen often use luxury "accessory" and "background" elements in order to associate the product with an ambience that reinforces its connotations of luxury (think for example of the latest Benetti or Ferretti Yachts advertising campaigns). Advertising has always been one of the main promotional instruments used by shipyards for marketing communications. Once more in the context of the four A's of communication, it is important to specify that advertising is the most powerful instrument for creating brand awareness. If the advertising is also creative it may contribute to forming image and to some extent also brand preference or at least acceptance. 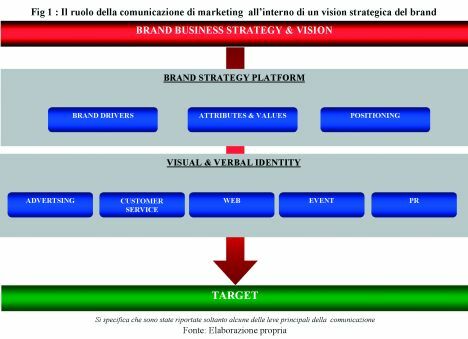 Figure 1 shows where advertising communication lies within a more strategic vision of the shipyard company, such as for example company brand management. In the context of this picture, with reference to the ends assigned to advertising, the most common mistake made by shipyards is to associate advertising with the single objective of increasing sales rather than trying to favour a behaviour deemed useful for company development (think for example of the importance of brand awareness with view to choice of purchase etc.). The main objective to assign to advertising - in the specific case of yachts - is to improve yard image, reinforce brand prestige and spread awareness of the range, new models launched and so on. From a survey carried out by the Nautical Market Observatory of the Tor Vergata University of Rome (www.marketingnautico.net) it emerged that most shipyards use advertising for promotional reasons but only 16% of the shipyards analysed use it in a strategic key with view to reinforcing brand and yard image. Whereas it is felt that advertising communication in the luxury yacht field assumes a fundamental role in building up the perception of luxury and prestige. This is further confirmed by a study carried out by a major management consultant (Deloitte) which, listing the main strategies deemed highly useful in evolution of the yachting sector, puts marketing investment in second place and communications investment in fourth place. So marketing communications, over and above operational value within company operations, may also take on a strategic role. From an analysis of the response given by the main advertising agencies operating on the luxury yacht market to the question "In your opinion, how is luxury yacht advertising compared with other similar economic segments (luxury products)?" it emerges that almost all the people interviewed feel that marketing communication in the yachting market is substantially "mediaeval" when compared with other high profile luxury product sectors. lack of a precise company identity (excluding the main shipyards). In analysing advertising communication, shipyards' cultural/professional approach was also analysed. In particular, the question "What's your overall evaluation of shipyards' cultural/professional approach to the theme of marketing communications?" revealed the prevailing opinion that most shipyards use medium-low profile operators. So one of the limits of shipyard marketing communications lies precisely in internal skills that don't always manage to fully configure the role of marketing communications within the company system. A further point analysed has to do with potential evolution of shipyards' way of communicating. In particular, the question "In your professional opinion, when, how and with what contents and methods will luxury yacht companies' way of communicating change?" elicited a prevalent response that underlined the lack of a real professional marketing management approach. Proceeding with the survey, almost 88% of the sample stated that shipyards do not check the efficacy of marketing communications actions, not even through ad hoc consultants. So the picture that emerges is a process of communication which is mainly unilateral with an absence of the feedback processes necessary to efficiently gauge all communication forces with view to backing up the company's strategic positioning and planned marketing objectives. With special reference to advertising, an attempt was made to understand its position within the target customer's cognitive system. Most of the advertising communications experts interviewed (93.8%) opined that, in the specific case of luxury yachts, advertising acts on the motivational system inasmuch as it permits highlighting the link between the product image perceived and the customer's desires, with the leverage of specific attributes. With reference to efficacy level of the main communications instruments as regards pursuing certain ends, Figure 2 supplies further interesting data. management events aimed at customers. Prevalent opinion states that among the various communications instruments the most effective with view to actual purchase is the boat show which, not by chance, represents the main budget item. Apropos of this it should be pointed out that, though boat shows are important for sales, just as other communications instruments are for other purposes described in Figure 2, the main challenge in shipyard marketing communications is the development of integrated communication capable of backing up, with the various instruments/channels, the shipyard's growth process. 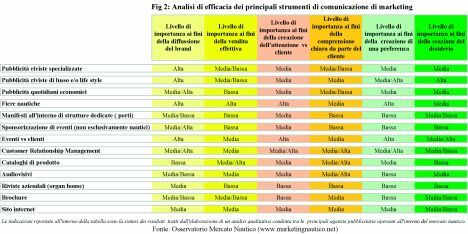 Going back to the content of advertising communications, an analysis was carried out on the advertising messages launched in recent years by certain leading yards operating in the luxury yacht market (see Figures 3 to 11). Before going into depth on the evolution of the advertising message, it is important to point out that customers receive information from advertisement images and then build up the status attributes of a given brand. So communicating the symbolic aspects of the luxury brand through an advertisement means emphasising the elements suitable for supplying an indication of the desired abstract dimension to be linked to the brand and product (e.g. prestige, exclusiveness, dream). The analysis was carried out by tracking the main advertisements on the international yachting scene over the past 20 years. It should be mentioned that only the most important advertising pages were used, both in terms of company and of reference period (the comparative-evolutionary activity of the advertising message was carried out with more or less 5 year steps). The primary aim was to analyse evolution of the advertising message adopted by shipyards over these years to spread awareness in the target market. The main result emerging from the analysis is that on the current international yachting market there are two main reference clusters in terms of marketing communications approach. On the one hand there are companies which in recent years have restructured their way of communicating, favoured by the development of a specific positioning of value within the reference market: in this context we have to mention the last Ferretti Yachts advertising campaigns, centred not so much on product as on lifestyle: Essere Ferretti (Being Ferretti). This cluster of companies aims at conveying an advertising message that increasingly tends to be unencumbered by product presentation (tangible factor) in order to emphasise the intangible drivers of what the company offers, such as lifestyle, exclusive relaxation, brand image, etc. On the other hand there are shipyards which, though as a whole they evince an evolution in the advertising structure of the message, aim at product-centred campaigns. It is important to specify that in the latter cluster there are not only small size shipyards or those operating on the domestic market but also companies with precise positioning in the luxury yacht sector. 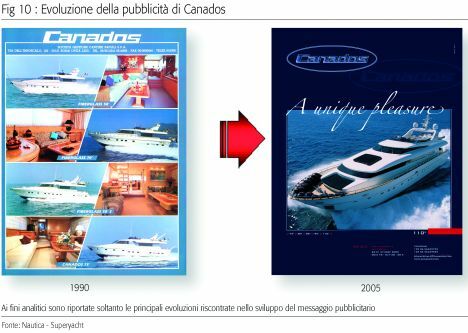 Figures 3 and 4, which respectively represent the advertising message evolution of Ferretti Yachts and Azimut Yachts, perfectly highlight how in the last 20 years the advertising message has evolved: from a simple and rudimentary presentation of the product (1985) to the expression of modern, advanced luxury. Another interesting case is Riva (see Figure 5) which in the last 15 years has gone from exhibiting the complete product range towards special accentuation of the brand (contributing to reinforcement of the so-called historic myth of the Riva brand). The other figures, each with its own specificity, demonstrate the evolution of yachting advertising over these years. Independently of the type of advertising message that tends to be transmitted to the target market, it may be noted that the main limitation in marketing communications management is the difficulty of translating competitive advantages into high value marketing drivers capable of favouring reinforcement of competitive position. The competition picture today concerns not only product but also a series of intangible factors that can make a difference with regard to reference competitors: this is where advertising plays a very precise role that should not be underestimated. On the whole the latest advertising data of these past 5 years allow us to highlight the spreading, in a yachting context, of a new advertising paradigm that is characterised by a substantial overturning in the management of company communications. The latest advertising campaigns of Benetti, Ferretti Yachts, Azimut Yachts and CNL bear witness to the fact that a new way of communicating is under way in the luxury yacht world.